Back of the Cereal Box: Big Hair or Big Head? 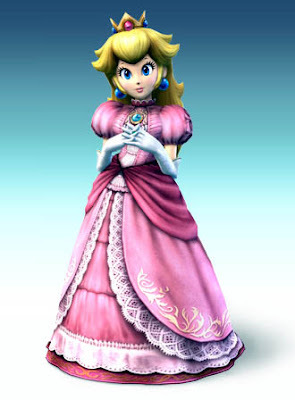 As of last night, Super Mario Bros. damsel Peach was announced as a playable fighter in Super Smash Bros. Brawl. Below, she appears rendered far more realistically than she usually does in her home series. Is it just me, or does the lady's head appear to be abnormally large? Sure, it has to be big in order to accommodate those giant eyes, but I worry for her safety when she's engaging in physical combat with what amounts to a casaba melon balanced atop a celery stick. Don't forget how the Elephant Man died, folks.